The speaker enclosure (typically, a box) is critical in a home theater system. There are two major types of speaker enclosures, sealed and ported. Either way, a speaker enclosure should handle vibrations with ease and add little sound interference to the sound emanating from the speaker drivers. With all the shaking that speaker drivers do, if you have a flimsy speaker encasement, it’s going to make a lot of noise, fall apart, or both. 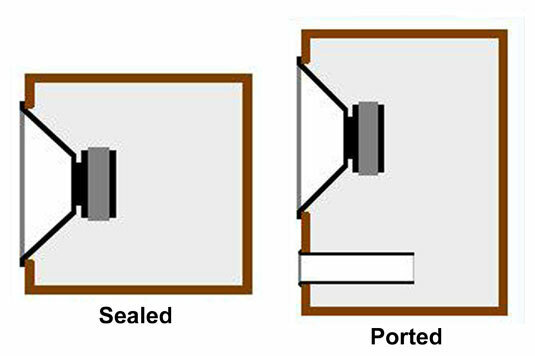 Sealed (or acoustic suspension) enclosures: A sealed enclosure is an airtight case. As your driver moves back and forth, the air pressure in the speaker constantly changes. This puts extra pressure from behind on the diaphragm as it moves in and out, and that takes extra power to overcome. On the positive side, that extra pressure makes the cone snap back and forth faster and with more precision, giving you a crisper, more accurate sound. Ported (or bass reflex) enclosures: In the front of this enclosure is a hole (port) that equalizes pressure between the inside and outside of the speaker. When the diaphragm moves back into the speaker, it increases the internal pressure, which is funneled out through the front port of the speaker. This action augments the sound waves traveling from the speaker, and increases the efficiency tremendously. The downside of a ported enclosure is that you may get less accurate results from a reproductive sound perspective. That’s because a ported enclosure doesn’t have the benefit of the extra pressure influencing the reverberating diaphragm. So the speaker sound might reproduce bass notes less precisely — substituting a louder boominess for a more realistic reproduction of the low notes. Ported enclosures can dramatically decrease your power requirements because they increase the bass output of a speaker by around 3 dB compared to a sealed enclosure. To match a 3 dB output boost through amplification, the power applied to the speaker needs to be doubled. So if a bass reflex enclosure speaker was powered with a 150-watt amplifier, a sealed enclosure speaker would require a 300-watt amplifier to produce the same output. In the end, you can be happy with either sealed or ported designs. Just keep in mind that these units handle bass differently and that good design and construction can minimize problems associated with either speaker design.